Exciting news! My company Browserling was featured on Product Hunt and it got over 500 votes, making it the product of the day! 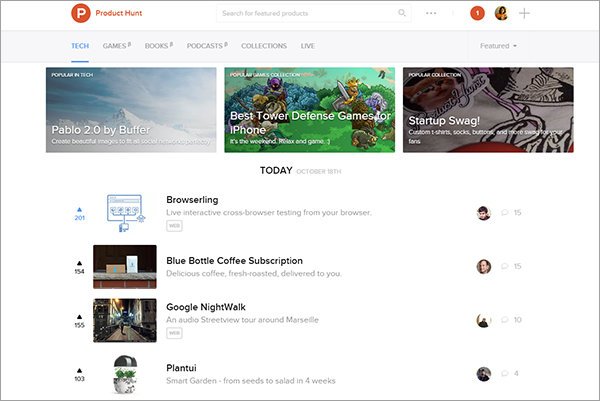 If you haven't heard about Product Hunt, it's a place for product-loving enthusiasts to share and geek out about the latest mobile apps, websites, hardware projects, and tech creations. In this blog post I want to quickly summarize what happens when you get on Product Hunt. The immediate effect is very similar to getting on front page of Hacker news or Reddit and you get a sudden spike of traffic. However unlike HN and Reddit, Product Hunt's traffic lasts for several days (as long as your product is visible on Product Hunt's home page), and if you make it as the top product of the day, you get featured on their mailing list, that sends more traffic. Browserling was product of the day on Product Hunt, Oct 18, 2015. Overall, I had 7-10 days of 2x-3x daily average traffic thanks to Product Hunt and I got tons of tweets, several writeups on various tech sites, 800% more signups and 300% more new customers (compared to daily average). Product hunt's traffic spike on Oct 18, 2015. I had to spin up a bunch of extra cloud servers to handle all this extra traffic. Be prepared that a day after you get features, Product Hunt's mailing list goes out so you'll have another sudden spike of traffic. I didn't know that but I've real time Google Analytics open 24/7 and noticed that. I've to run now. Other than that if you've a cool product, you've to get it on Product Hunt. It's a great site. I didn't find until 12 hours later that Browserling was submitted. And when you get on PH make sure to monitor Twitter and PH's comments and engage with people who're interested in your product.